A group of resourceful kids start ´solution-seekers.com,´ a website where ´cybervisitors´ can get answers to questions that trouble them. But when one questioner asks the true meaning of Christmas, the kids seek to unravel the mystery by journeying back through the prophecies of the Old Testament. What they find is a series of ´S´ words that reveal a ´spectacular story!´ With creative characters, humorous dialogue and great music, The ´S´ Files is a children´s Christmas musical your kids will love performing. Verlag: Schott Music, Mainz / Eulenburg, L.
Sinfonie Nr. 103 Es-Dur Hob. 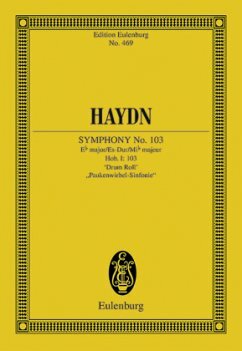 I:103 (Paukenwirbel-Sinfonie), Partitur bei Amazon.